Nearly a half hour of light language channeled by Audrey Light Language­ the original session. Enjoy the powerful and soothing sound healing vibrations to heal on a multitude of levels­ ethetic, physical, mental, and emotional bodies, including removal of generational and childhood issues and traumas. A little over a half hour of light language channeled by Audrey Light Language­ the second session and evolution of the work. Powerful and comforting sound healing promoting DNA upgrades/vibration raising, releasing from this life and multidimensional aspects of self, removal of long­standing blockages. Latest evolution of Audrey Light Language’s work-­ powerful and soothing light language and language of the Akash, channeled fairies and many of the highest energies for multi­level and multi-dimensional healing, DNA opening/upgrades, and igniting of your own gifts and light language. 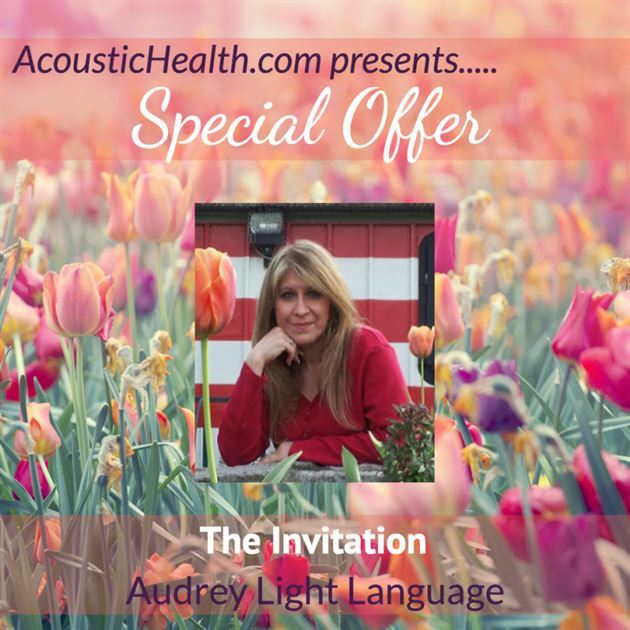 A very special message people all over the world have cherished­ channeled by Audrey Light Language directly from Source, “The One”­ listen to the words and feel the pure energy in the message. Audrey Light Language Soul Architect and Energy Engineer is offering with this package a 90 minute private session with her in which she will speak the Languages of Light for you and the Language of the Akash that is not a reading of the Akash but is to REWRITE it for you. Rather then going over old maps and recipes and agreements and contracts and also dealing with what has been contaminated The Language of the Akash rewrites it for you to be in acclimation of the new upgraded higher frequencies. In this session Audrey will also bring through the Sacred Key Code Number Language of Source ,God , Creation , The wellspring of consciousness The number codes are a Long list of numbers 100’s long That work on your multidimensional DNA and your field. All of Audrey’s work brings through the necessary releasing of the old energy and then brings through codes for up grades to your system which help you be in resonance with the New higher frequencies that are part of this ascension assisting us upon our EVOLutionary journey and the expansion of consciousness itself . In your 90 min session Audrey will also bring through the Beings of Light that she channels to be in communication with you as they call it . The Beings of Light is the name Audrey has given them as Their name is their energy signature They are high vibrational beings part of the ALL that Is and are in remembrance of that and so they come to be in communication with us as they call it and to help us recall that we Are the Master piece and the Master One and the same and its time to throw away the crutches and training wheels we are used to and stand on our own. They say does a Master hold its brushes with paints and await someone to come by for him to ask them where he/she should place the paint brush upon the canvas or where to put a bit more paint or not NO a master creates its creation and stands back and looks assesses its creation and makes adjustments as it births and brings fourths its works of arts. Many people around the world have actually felt the Beings of Light when in a session with Audrey as they speak to them and are wrapped in their high energy and love. These sessions have many beings and also aspects of Audrey coming through to assist a client with what they need. Audrey brings through the fairy realms to touch the inner child and the Ancient Ones and Native Americans to help release generational ancestral lineages and ties and blocks. The Galactic s come in to work upon the multidimensional and galactic portions of you so as to have a full healing that encompasses the many aspects of you then just your Earthly ones. As a Soul Architect and Energy Engineer Audrey works upon you at the core or your being your Soul , your essence as that is what you are is it not said you are Souls having experiences and so it is why Spirit has given her that title of Soul Architect to help you upon your soul EVOLution and expansion of your consciousness as she works with the energy as a energy engineer to clear, move and upgrade the essence of your being These Are great wondrous miraculous times with an opportunity open for existence to wake the sleeping portions of itself to remembrance of self and their place within the shelf hood and the opportunity to take your sovereignty back and stand empowered in the knowing that you are a spark of Divinity and take your birthright back to help create the New. As a Creator Being why limit yourself to only 5-D when all the D’s up to 12-D and beyond are open to you if you are in resonance and stand in your beingness and remembrance of yourself as your true essence as a spark of Divinity. Allow me, Audrey, through private sessions to help you stand in your power, divine birth right, and sovereignty as you help to create the new.